Even though Pentecost already took place and the Gospel message has been heard all over the world in many languages, an international gathering like a General Congregation does need the support of translation services. Before the Congregation, all the delegates were told that there would be three official languages used in the aula in during the main events of the Congregation: English, Spanish and French. Simultaneous translation would be available, in the aula, between these languages. Anyone could also choose to speak in Italian and he would be translated in the three official languages. During the liturgies and the morning prayers, songs and some prayers in several other languages have been proposed. Finally, it was also clear from the beginning that the written documents produced for and during the GC would be published only in two languages: English and Spanish. It was determined that all the members of the Congregation had at least a passive knowledge of one of these two languages. 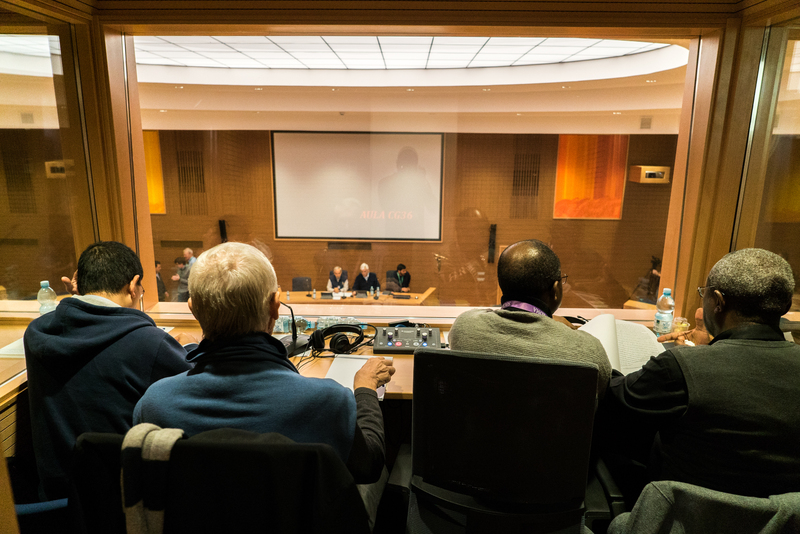 The work of simultaneous interpretation is shared between some ten Jesuits from a number of countries around the world: Spain, France, Chile, Zimbabwe, Malta, South Africa, Democratic Republic of Congo and India. Each one usually translates in his mother tongue, from one or two other languages. When the are not requested in the aula, for instance during the Regional groups meetings, these men often contribute, with some members of the regular staff of the curia, to the translation of written documents. And they cannot be slow… the documents might be needed for the next session or the next morning. We have asked a few members of the team to tell us about their work.